Vocational and trade schools in Virginia are designed to help students who want to earn their degree or certificate and immediately transition into the workforce. Virginia’s Secretary of Education, Anne Holton, sums it up: “Everybody should have the opportunity to go to college, but many people should have the opportunity to make great careers doing things that have different pathways to success.” This drive to make the most of every opportunity in Virginia’s job market is one of the reasons why there are so many vocational, trade and career schools in the state. This page focuses on helping students find the right vocational school, as well as what to expect upon graduation. 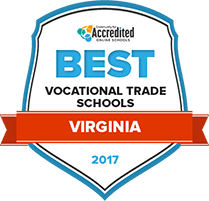 Students interested in attending a trade or vocational school in Virginia have many options available. Of special interest to Virginia students studying at any of the many community colleges, career schools or vocational institutions are programs in the allied health fields, many of which are growing very quickly. To make sense of all the options, our rankings of accredited Virginia schools look at how they stack up in terms of tuition, financial aid availability, program quality and the like. The college has guaranteed admission agreements with several colleges and universities, both public and private. Students can transfer to any of these four-year schools after earning any one of seven available associate degrees. The Z Degree program lets students achieve a degree without ever paying for books, but instead utilizing only electronic course materials. In 2016, the college is rolling out an accelerated degree pilot program that lets students earn a two-year associate degree in just one year. The degree will meet the freshman and sophomore requirements of most four-year colleges, allowing students to transfer into a bachelor's program as a junior. There are five programs of study that culminate in transferable Associate of Arts and Science degrees. Students can also pursue several certificates and technical programs. Students can take advantage of an on-campus library, a bookstore and parking and bus services. Student services include academic support, admission guidance, career and disabilities services and special programs for veterans. The campus is home to several academic, social and honors clubs, as well as a range of athletic events and associations. Some high school students can participate in the dual credit program, and the college offers assistance with placement examinations. Students can earn several different Associate in Arts and Science degrees and Associate in Applied Science degrees, as well as several vocational degrees and certificates, depending on which one of two campuses they attend. The school has a program that grants credit for some advanced placement study, and placement testing is available, as is preparation for the placement test. The Pre-Engineering Academy is designed to help prepare students for entry into four-year bachelor's programs. The school offers special programs specifically for veterans, reservists, active military personnel and their eligible dependants. The school is accredited by the Commission on Colleges of the Southern Association of Colleges and Schools. As the second largest community college in the country, Northern Virginia Community College is conveniently spread out over six locations in Virginia, each offering countless one-year and two-year vocational programs. For students in need of a more flexible schedule but still wish for traditional academic instruction, NVCC’s Extended Learning Institute offers numerous hybrid courses that split the semester between online and in-class discussion. NVCC also offers a Guaranteed Admission Agreement that ensures qualified graduates’ admission to nearby universities. Students also have the option to contact Coordinated Internship & Cooperative Education Services to gain work-based experience to prepare for their future. Students have the chance to earn certificates from dozens of vocational programs at New River Community College. Many of these programs offer transfer opportunities­ for students seeking a bachelor’s degree at another four-year college, allowing for a more relaxed and low-cost first two years of study. Trades license renewal courses for experienced electricians, plumbers, HVAC mechanics, and gas fitters are offered as well. NRCC prides itself on its affordability and awards millions of dollars in scholarships and financial aid to high-achieving students annually. With NRCC’s Accountability in Student Learning Program, students will have the educational support necessary to succeed in their academic career. Piedmont Virginia Community College provides students with the opportunity to select from over 20 associate vocational programs spread over eight fields of focus. Many of the courses required for these programs are offered online through ed2go, allowing for flexible schedule management. Career services and academic advising are also available to students, as well as daytime childcare through the Piedmont Family YMCA. Numerous clubs, both athletic and non-athletic, are hosted on campus, including a Phi Theta Kappa chapter for honors students. Through the PVCC Dual Enrollment program, eligible high school students may save money by working to earn college credit while completing their diploma. TNCC's accreditation by the Southern Association of Colleges and Schools Commission on Colleges (SACSCOC) was reaffirmed in 2016. The college has guaranteed admission agreements with more than 30 four-year schools across Virginia. Vocational degrees are available across five academic divisions. Student services include library and tutoring services. The SAILS program uses technology to identify and help at-risk students, and the school offers peer mentoring, counseling and mental health services. Academic support includes a testing center, advisement and the TRiO student support program. Career services are available to students, as is help with job searches. There are numerous ways for students to take advantage of career and technical education in Virginia. Comprehensive high schools, as well as those that offer dual credit courses, are one path for motivated students; there are also several technical high schools and career centers throughout the state. Those on the post-secondary level can pursue their education through the community college system, in addition to the possibilities offered through trade schools, vocational schools and dedicated, specialized career centers. The following search tool can help aspiring students narrow down their options among career and technical education (CTE) offerings in Virginia to find the school that’s right for them. 31,223 degrees & certificates were awarded by all two-year public institutions in Virginia during the 2013-2014 school year. During the 2013-2014 school year, the Virginia Community College System awarded 17,908 associate degrees, 7,213 certificates that required one year of study or more, and 5,701 certificates that required less than one year of study. Those who graduated with an associate degree were making a median wage of $36,372 when surveyed 18 months after graduation. Those with a certificate were making a median wage of $28,490. The most popular areas of vocational study in Virginia are business, management, and administration; human services; and science, technology, engineering and math. There are currently dozens of private vocational institutions certified to operate in Virginia, offering education in trades ranging from bartending to dental assisting to computer learning. This is in addition to the vast community college system, which offers associate degrees and certificates at 23 colleges across 40 campuses in the state. The Virginia Community College System is well into pursuing an initiative called Complete 2021, with the goal of tripling the number of credentials that students earn in academic and workforce areas. The following chart displays the breakdown of undergraduate degrees and certificates earned in Virginia compared to the national average. Health science is a popular educational field in Virginia, and the needed jobs in the state reflect this: according to Projections Central, 12 of the 20 fastest growing jobs are in the healthcare field, and require an associate degree or less to begin work. In fact, several of the largest employers in the state are in the healthcare industry, including HCA Holdings Inc., Sentara Healthcare and Inova Health System. Other companies looking to hire many new employees include those in the food industry, as well as those involved in a variety of manufacturing industries, such as Northrop Grumman Corporation, General Dynamics and ManTech International. Virginia Beach is the most populous city in Virginia. To meet the training demands of such a large population, Virginia Beach has opened the doors to numerous vocational and trade schools, including the Advanced Fuller School of Massage Therapy, the Chrysm Institute of Esthetics, the Internet Marketing Training Center, and the Dental Careers Foundation, among many others. It is also home to the Virginia Beach Technical Career Education Center, designed for high school students to get ahead in career education. Regent University, though a four-year institution, also offers numerous associate degree programs, both on campus and online. Nearby Stratford University offers associate degrees in areas such as business administration, network management and security, culinary arts, and medical insurance billing and coding. Diplomas and associate degrees are available through ECPI University, while Tidewater Community College is home to numerous associate and certificate programs, as well as prep courses for earning credentials in fields such as automotive or health professions. Given the prime location on the Atlantic Ocean, Virginia Beach is a haven of tourism, which bodes well for those seeking culinary or hospitality degrees or certificates. Maritime and logistical services play a large part in the local economy, as do advanced manufacturing and defense. Biomedical and life sciences, including companies such as Sentara Healthcare and LifeNet Health, offer numerous positions in the medical and pharmaceutical field for those who graduate from Virginia Beach vocational and trade schools. This career and technical education student organization offers in-depth information for those who want to pursue a career in healthcare. In addition to general information on higher education, this site offers a list of vocational and trade schools in the state, as well as their accreditation status. Designed for those interested in doing business in Virginia Beach, the publications offered here are of good use to those who are entering the workforce in the area. Designed for educators in the vocational and career colleges system, this site also offers information for students who are considering CTE training. Open to those who intend to make a difference in marketing, hospitality and tourism, finance, and business administration and management, this organization is targeted for both high school and postsecondary students. The perfect place for students to learn what to expect from their future careers.